Every new country presents a new set of customs, cultural understandings and practical circumstances. Learning a country – the people, the values, the plumbing – is one of the things I love most about travelling. There is something inherently thrilling about saying ‘thank you’ or ‘hello’ in a foreign language (and being understood) or figuring out how to cross the street in the seeming absence of road rules. I also find delight in spontaneous conversations with locals on the street; the chance to learn why school children are around in the middle of the day, where the best local food is or how people support a family of twenty in a shoe-box-sized house. Yesterday was a day of wandering, learning and exploring the culture. As I’ve found in other countries, the commercial district seems the best place to casually engage with locals. 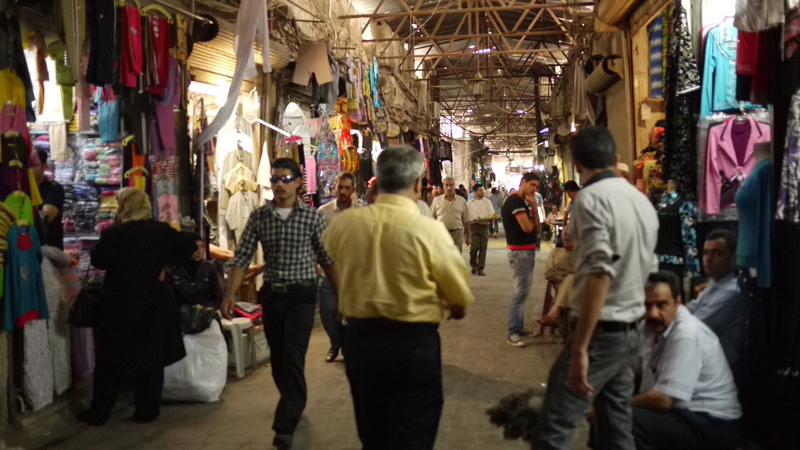 Walking through the cool stone halls of the souq, I was greeted with the typical one-liners – ‘come waste all your money with me’, ‘Lady, lady, you are so beautiful, come see my shop’ – but also a lot of genuine interest in the life of a foreigner and my impressions of Aleppo and Syria. Wandering into a jewellery store (called ‘Sebastian’), I was offered tea, asked about Brisbane, my work, my travels and told about the art of silversmiths, the types of tourists that come here and the owner’s family. Noted, this polite interaction is also part of a well choreographed sales pitch, but when you are aware of this, and your choice to stay or leave with a smile, talking to shop owners is an excellent source of local insight. I was intrigued to listen to the well-spoken English and encounter a clever dead-pan humour woven into social commentary that accompanied each sales pitch. Jokes about propriety, wealth and family (including the odd mother joke) were quite similar to those you would hear in a bar at home, highlighting again that humans really are so similar the world over. That said, there are some notable cultural difference that have been interesting to learn. For instance, many Syrians have answered a question about a schedule or facility availability with ‘in sha ‘Allah’ (God willing). To me, this indicates not only the central role of God in Syrian society, but also the cultural acceptance that things do not always work as people intend. A stark comparison to the timetabled way of the west, no doubt I will encounter this principle a lot over the coming weeks in the Middle East. When buying falafel and salad on the street, I was approached by a local English teacher who keenly explained the basics of Islam and the education system in Syria. 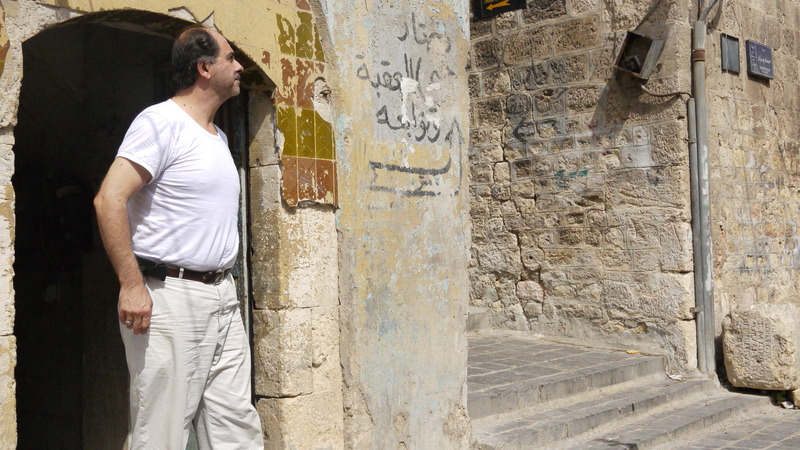 Then, when wandering down alleys in the Christian Quarter, Ruth and I were approached by a man who studied in England and had a soft spot for football. 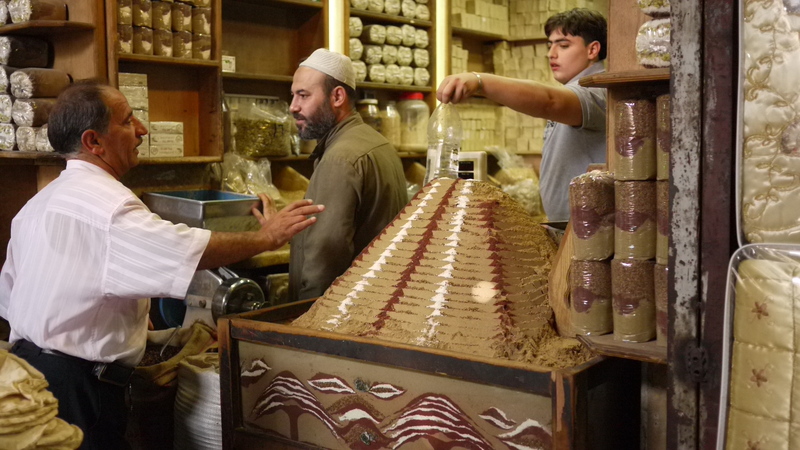 When buying linen scarves, I spoke to a the shop owner about his choice to stay in Aleppo for his family rather move to another city where a textile shop would be more lucrative. Each of these people, with their polite manner and enthusiastic conversation, helped me to learn a little piece of Syria. I’ve also been charmed by the hotel staff here at Hotel Baron. One of the managers is a jolly old fellow (who personally collected me from the airport in the early AM) and has welcomed me at every sighting with a grin and ‘Hello Miss Nicole’. He is positively lovely, taking every lingering chance to strike up a conversation about how I spent my day in Aleppo and offering me delicious Turkish coffee ‘on the house Miss Nicole’. There is also a squat, round old lady who works in the general reception area and seems to have the whole hotel running like clockwork with her pushy gestures and wicked smile. She means well, of course, but also has a dead-pan sense of humour that leaves you trying to figure out if you are being reprimanded or played. When I asked for an extra hard boiled egg instead of the gluten-full bread at breakfast, she waggled her stumpy index finger at me and said with a stern face, ‘Don’t you know that eggs are very bad and bread is very good?’. In the seconds it took me to read her tone, she had started cackling like a drunken witch and saying, ‘Don’t you worry Miss Nicole, it’s okay’. But tomorrow I will be leaving this slightly derelict, beautiful old hotel with the tour group and travel by bus to the town of Hama. From there we will visit the one of the dead cities of the old trade route, Sergilla, see the fifth century church of St. Simeon and have a chance to meet some of the more conservative townsfolk of Syria. I wonder if you would have the same reflectiveness if you were in Siria today. As we track up to the very top of the hierachy of needs we tend to forget where we have been. It is very interesting how in just eighteen short months how a country can change. Where then you we in a place of self actualisation, today you would be struggling for shelter and food. Thinking back to Syria now, I feel so sad for the people and realise how much we (in the Western world/ Australia) take our status-quo (level of security, safety and comfortable living standards) for granted. I thought I realised it before, but seeing it taken so quickly from a society, as happens in so many parts of the world, makes me realise it is a kind of horror that can never been known until it has been experienced.